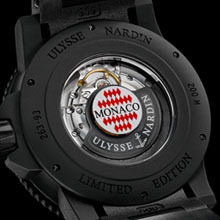 Ulysse Nardin Unveils the Monaco 2010 Marine Diver Limited Edition at the 2010 Monaco Yacht Show. 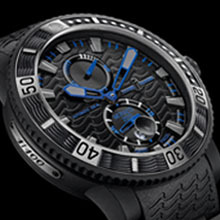 Ulysse Nardin conquers the oceans once again as an official sponsor of the 2010 Monaco Yacht Show – the World’s Luxury Yacht Showplace – and celebrates the superyacht exhibition’s 20th anniversary with the new, limited-edition Monaco 2010 Marine Diver, to be unveiled at the opening. been expertly steering captains and their crews with faultless precision by way of its marine chronometers. As the latest addition to the coveted Marine Diver collection, the Monaco 2010 – limited to 100 pieces and individually numbered – showcases Ulysse Nardin’s evolution in watchmaking technology, beginning with the Monaco’s specially treated stainless-steel case. Having undergone a complex vulcanization process, the case (45.8 millimeters in diameter) is revealed with a matte-black rubber coating, presenting a sporty aesthetic and comfortable feel. Its exhibition case-back reveals a self-winding movement. Softening its styling is a calming elegance that washes over this watch in the form of a signature wave pattern decorating the black, structured strap and dial with its power-reserve indicator and the oversized small-seconds register. As well, it is water-resistant to 200 meters. Strengthening its already exceptional reliability is the Monaco’s rubber band including ceramic components and an exclusive black ceramic folding clasp. For the second year, Ulysse Nardin is an official sponsor of the Monaco Yacht Show. Therefore, it’s only fitting that  the largest superyacht exhibition in the world be honored with a custom-designed timepiece to commemorate the celebration of its 20-year history. 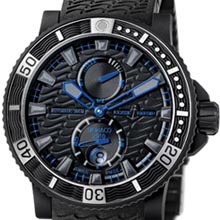 The new, limited-edition Monaco 2010 Marine Diver gives a nod to the show, as well as Ulysse Nardin’s own seafaring stories.